“There will come a time when a diseased condition will not be described as it is today by physicians and psychologists, but it will be spoken of in musical terms, as one would speak of a piano that was out of tune” - Rudolf Steiner. It has only been since the age of science that the west seems to have lost its cultural memory regarding the power of sound as a healing modality. Internally by exercising the power of voice or externally by exposure to music, tones, beats and chants – sound has always had the power to cure what ails you. The Greeks of antiquity knew it ...both healing and music belonged under the auspices of the same deity, Apollo, the Sun God. "A person does not hear sound only through the ears; he hears sound through every pore of his body. It permeates the entire being, and according to its particular influence either slows or quickens the rhythm of the blood circulation. It either wakens or soothes the nervous system. It arouses a person to greater passions or it calms him by bringing him peace,” explains Sufi musician and author Hazrat Inayat Khan. “Sound becomes visible in the form of radiance ...the same energy which goes into the form of sound before being visible is absorbed, as the physical body recuperates and becomes charged with new magnetism." For more than 5000 thousand years, every musical instrument in China had to be tuned in accordance with the imperial tone which was called Kung. The Emperor’s responsibility was to be certain that the Kung was in perfect harmony with the ever-changing celestial influences to insure that divine energies continued to flow from above, manifesting as harmony below.If you think that you are not a part of this celestial symphony, simply stop and listen to your own heart. It beats in a continuous rhythm. The Earth too produces a global electronic beat, a wave with a fundamental frequency that oscillates at approximately 7.83 Hz. This wave and its harmonics are known as the Schumann resonances, named after physicist Winfried Otto Schumann who predicted them mathematically in 1952. After his colleague Hans Berger invented the EEG machine which led to the first recording of human brain frequencies and upon reading Schumann’s results about the Earth’s frequency, Dr. Anker Mueller realized that the frequency of the earth was an exact match with the alpha wave frequency of the human brain. That skeptical “brain” which perceives the world around you is made up of specialized nerve cells called neurons that switch on and off in a binary dance with the planet, in action and then at rest. Those atoms that make up the cells of your body are whirling in harmony with the stars and planets of the universe. At least they are as long as you are healthy and in a state of balance. Since the early eighties, Peter Hess has been studying radiesthesia, a compound word that describes a form of sound healing. The initial radi couples radio waves or radiation with aesthesia, (the counter-opposite of anaesthesia) a state of alert mental responsiveness in which you are aware of yourself and your situation. If tuning forks will resonate in sympathetic harmony, so will the cells and organs of your body. Based on his experience with sound healing in Nepal and Tibet, Peter Hess started to experiment and study the effects of singing bowls on the human mind and body to form the basis of his theories of sound massage. The results of his more than 30 years of work are worldwide starting with the founding of the Peter Hess Sound Massage Institute in Germany, where sound healing is integrated into the nation’s medical system. “The tangible world is movement, not a collection of moving objects, but movement itself. There are no objects 'in movement.' It is the movements which constitute the objects, which appear to us; there are nothing but movements," explains Alexandra David-Neel and Tibetan lama Aphur Yongden in their book, The Secret Oral Teachings in Tibetan Buddhist Sects. 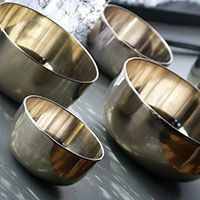 Sound massage with singing bowls is movement of the cells, atoms and electronic aura of your body accomplished by placing a select metal and tonal bowl on the dressed body or within the aura of an individual. Then, they are tapped gently with a felt mallet to cause them to resonate. Anyone who wants to experience a sound massage may do so by appointment with Gina Armstrong. She is one of only six accredited Peter Hess Trainers and sound massage therapists in the USA. For the first time in America, Janusz Urzykowski, from Poland; Alex Andrzejewski from Australia and Gina Armstrong will be bringing the Peter Hess Sound Massage Training here to Balance on Buffalo in Manitowoc from May 19 - 25, 2014. For more information stop in or visit www.balanceonbuffalo.com.